Smallholders systems are often characterized by low soil fertility due to limited use of fertilizer inputs and ongoing soil degradation. This affects how crop respond to climate change. But many crop models were created for high fertility cropping systems. How well do they work in other systems? More than 300 scientists from 47 nations met in Berlin, Germany, during March 15-17, 2016 to exchange ideas on improvement and application of crop simulation models to better predict agricultural production and food security under global climate change. The symposium was co-organized by AgMIP (the Agricultural Model Intercomparison and Improvement Project) and MACSUR (Modelling European Agriculture with Climate Change for Food Security), and was locally hosted by the Leibniz Centre for Agricultural Landscape Research (ZALF) in Müncheberg, Germany. The organizing committee included representation from AgMIP (Kenneth Boote, University of Florida, and Peter Thorburn, CSIRO-Australia) and from MACSUR (Frank Ewert, ZALF, and Reimund Rötter, Finland). Dr. Claas Nendel, ZALF, was the responsible local host and organizer. Some of the more notable and adverse effects of climate change are weather extremes. These events occur on a much shorter time-scale than climatic shifts, but can be influenced by the overarching, changing climate of a region. Extreme phenomena can also have immediate and detrimental impacts on food systems in the areas affected. To present updated research on the frequency of extreme events, a panel of British and American scientists took part in a congressional briefing earlier this month. On January 20th, the American Meteorological Society hosted a Congressional briefing on Climate Change and Food Security as part of their ongoing Capitol Hill Briefing Series. In attendance was Prof. Bill Easterling, Dean of College of Earth and Mineral Sciences at Penn State University; Prof. Ed Carr, Director of International Development, Community, and Environment Dept. of Clark University, and Assistant Professor Sonali McDermid, AgMIP Climate Co-Lead and Resource Person for the South India Regional Integrated Assessment Team. The AGU publication Eos, a source for perspectives about the Earth and space sciences and their impact, has just published a meeting report about the AgMIP Workshop on Coordinated Global and Regional Integrated Assessments (CGRA) of Climate Change and Food Security held in Aspen Colorado. The report titled, Assessing Impacts of Climate Change on Food Security Worldwide, outlines the goals and outcomes of the meetings well as future plans for CGRA. The CGRA workshop was one of the first efforts to focus on the melding together of differing disciplines and scales to develop a more consistent and complete assessment of food security. Read the Eos Workshop Report here. Small-scale farm systems have become increasingly susceptible to climate change impacts in the recent decades. The people in Navrongo, a town located in the Upper East region of Ghana, have especially experienced difficulties. “There is a real problem with rainfall,” one local farmer noted, “when we were young, we planted millet in April. Gradually, we started planting in May, June, and now, in July.” This changing rainfall pattern has made it more difficult for farmers. The seasons are shorter and yields are not what they once were. The changing climate projects an even bleaker future. 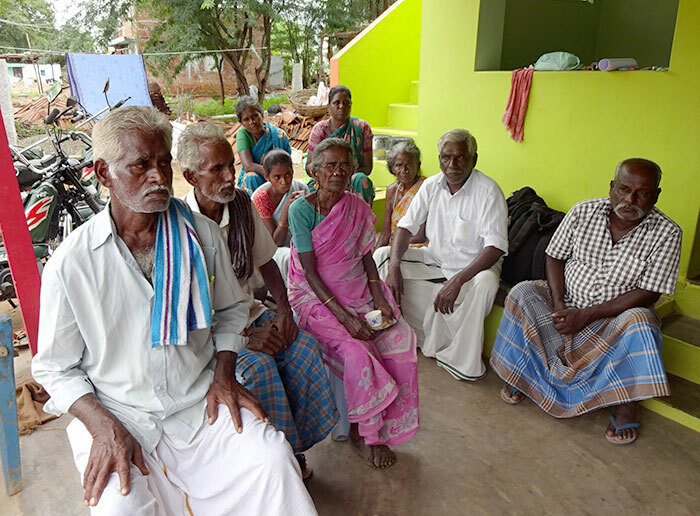 In the middle of November 2015, as Tamil Nadu, India was experiencing some of the worst flooding in its history; a team of AgMIP researchers arrived to meet with agriculture stakeholders in Southern India. The AgMIP Southern India Regional Research Team, led by Dr. V. Geethalakshmi, had arranged a series of ambitious meetings with local government ministers and business leaders to present outcomes of AgMIP research, and to plan for engaging policy makers and state administrators going forward. Despite the inclement weather and transportation difficulties the group met with stakeholders in Chennai, Tamil Nadu, India on November 17. More than 90% of the invitees attended the workshop where they agreed there could not have been a better time to talk about climate. The overarching goal of food security assessment is to find a method that persists through time and space and is continuously reliable. Scientists have formulated food security indicators for their assessments but most at the present fall short in adequately gauging food security. In a newly released chapter by John Antle, Roshan Adhikari, and Stephanie Price in the book Food Security in an Uncertain World the authors propose a better method of measuring food security, an Income-based Food Security Indicator (IBFS). This indicator differs from other methods in that it uses economic farm household models for policy, technology, and climate impact assessment. This incorporation of economics allows for the analysis of changes in income and its corresponding effect on food security.